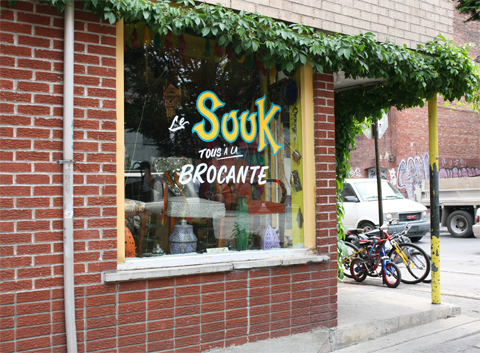 I met Claude Dolbec at Cafe Laika, in Montreal, Canada, in mid-June to talk with him about his work as a letterer, and about the Montreal lettering scene. 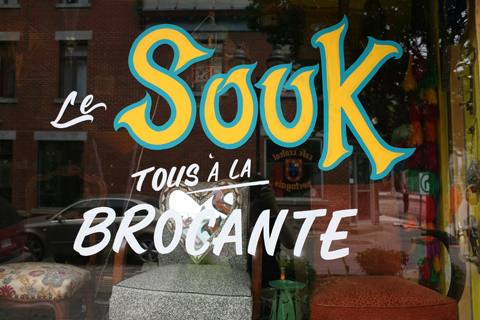 Claude has been doing lettering for almost twenty-five years now. He is an autodidact, and before getting into lettering he was active in another artisanal field, that of the shoemaker. He used to repair horse saddles, and worked in shoe factories. 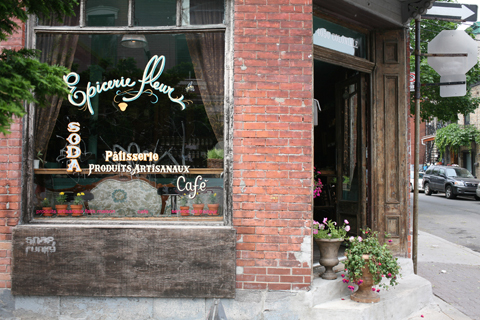 Claude has shaped the look of the fronts of many shops and restaurants around a few Montreal neighborhoods, mainly the Plateau and Mile End, the two areas he finds the most attractive and most pleasant in Montreal. He has lived in these neighborhoods for years, and he knows their people well. "People" are one of his motivations to do lettering. He repeats frequently during the talk "j'aime les gens" (I like people). For Claude, it is a good way to stay connected to the public and meet people. He says that it is thanks to these people that lettering is still alive. People who commission the work preserve the lettering culture. He sees himself merely as someone who gives shape to this spirit; in fact, his modesty is such that he does not even sign his lettering work. Claude believes that, as with other artisan activities (such as that of the shoemaker), hand lettering is becoming a lost art. His role is to keep the art of lettering going, especially the type of lettering where a touch of hand-work is noticeable, as opposed to the more prevalent "computerized" lettering. Claude enjoys his work so much that he feels as if he is “on holidays all the time". His goal is not so much financial as it is personal satisfaction; it is even doubtful that he can make a living purely off his lettering work. In fact, he has a very generous attitude when billing a job. For a second-hand shop who has already a hard time making ends meet, he says, he normally charges a very low amount, say 50$, and will supplement his earnings with an object from this shop. The amount he charges also depends on his relationship with the customer. For friends, he would consider doing it pro bono. Claude does not work year round, but he is active in the summer months, a season that lasts for three or four months. He usually receives his commissions trough word-of-mouth referrals. When he gets a commission, Claude is careful to check out the place first. He often does sketches, and considers it important to look not only at the location in itself, but also at neighboring places. This helps him fit in the lettering of the location with its environment. It also happens that he refuses a particular job. He does not appreciate people whose attitude is that, because he works manually and without a computer, he must be poor, and therefore inexpensive. When this happens, he refuses collaboration. He prefers when his patrons have an idea of the atmosphere they wish to create for their business. Sometimes, he gets commissioned by merchants or restaurant owners with Italian or Portuguese background, and he likes to integrate their culture in his letterings. Claude can do whatever is needed, from letters to decorations, in short, he says, anything that looks nice. What he does not consider nice are computer-constructed letters which lack the presence of the hand. As an example, he mentions the Laika logo. "People think this has more quality, because it looks more serious", he claims, but he finds it "cold looking" and for him, it “means a completely different world". Instead, his style is inspired by American vintage magazines from the 40s and 50s, such as New Yorker or Life, using a lot of script-like letter shapes. He uses mainly brushes, which he orders from the United States, and paint. He finds it important to experiment with new colors, such as the combination of a grayish blue and brown or a blue and pink instead of sticking to the very common combination of red and yellow. Interestingly, Claude explains that it is not necessary any more to paint backwards, because most windows today are double windows. He can therefore paint directly on the interior window. 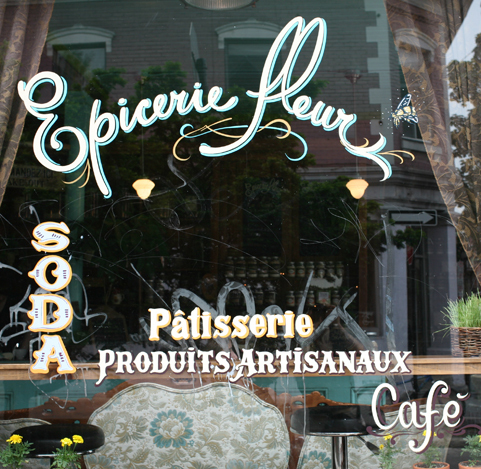 He says the problem of painting inside a window in general is that you would see too much of the reflection of the street on the exterior window glass, which can make the lettering itself less apparent. To avoid this, he prefers doing it straight onto the surface of the exterior glass. While he works by himself most of the time, he also used to have apprentices. Last year he had two apprentices. One of them, he says, was very enjoyable because he did not bother him with too many questions, but would rather learn through observation. Claude is careful when taking on apprentices, who are often only interested in the money they can make. "I could never work with someone like this beside me,” he says, referring to anyone more interested in money than the craft itself. According to Claude, there are not many letterers in town: "It seems that they are all alcoholics, a little bit like me", he says, "but the bad thing about them is that there is a few who start but do not finish their work". Sometimes it happens that Claude is mixed up with a few other artists named Claude, who also happen to be letterpainters. However, one Claude is more active in the downtown area. The other Claude is the "fake Claude", the evil twin who pretends to be Claude the letter painter and shows up to take money for a job that he, of course, will never do. Claude is totally opposed to the idea of ever seeing his letterings digitized. He is not interested in preserving his work in a digital way, because this goes against the very idea of using his hands to make letters. The nice thing about lettering is essentially the manual work it involves. He executes the whole process in front of the client. This makes it, according to him, much easier to get his handmade lettering accepted. When a client chooses computer lettering, and it is simply glued to the window, it is much more likely to be unsatisfactory work. Unfortunately, the Plateau is often the scene of acts of vandalism by acid, the targets of which are restaurant and shop windows. Claude usually covers up the damage by adding lettering on top of it. 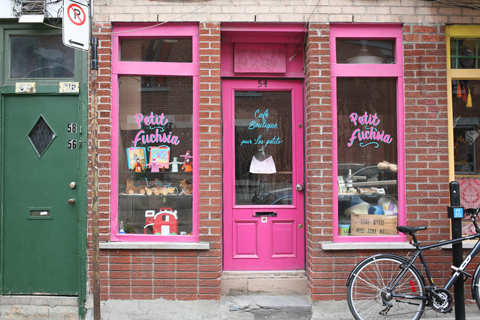 Fuchsia: Claude claims that since he did their lettering, “people enter the place more frequently". 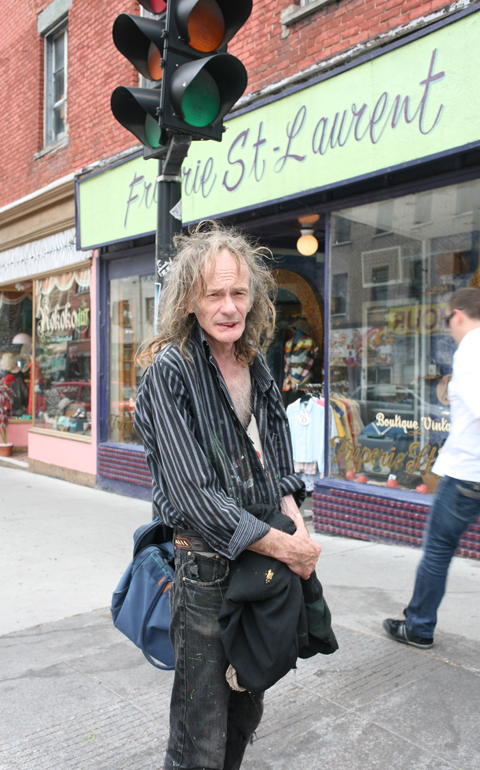 In the street's of Montreal's Plateau and Mile End neighborhood, Claude can be recognized by his blue bag he often carries with him, which contains everything he needs to start a new lettering job. I thought this was a very illuminating look at a person of character trying to wend his way through this modern life , I applaud him for staying true to his heart and you for presenting his story. Ah bein CLAUDE !!!! Tres beau travail mon homme. Un grand Ami des vieilles années 80 avec Michel Demeule, Mario Ethier, Ken Lekman, Ben "Base". 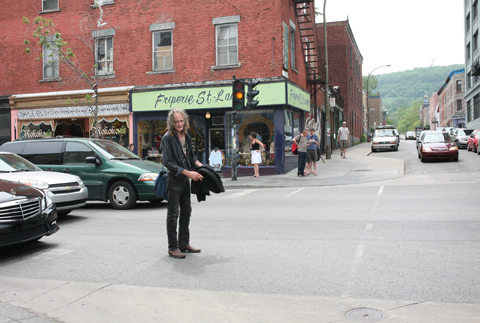 If there would be someone in town of Montreal for monument to describe the world of an artist, it would be Claude Dolbec, He would also be the most underground caracter that been in town so long... Ask him about 70's, 80's, new wave punk scene, batcave, gothic, alternative... ealy years I'm talking about... he was there, he's pure, a person you can trust also, just give him a brush, paint, or pencil and magic he will do in your face, in mather of 50 sec... 80% of comercial windows on the Main and around Plateau Mt-Royal been done by Mr. Dolbec since 80's... Go-Go Lounge original walls graft ceilling and floors at the openning were done by him... One name comes to me when I see Mr. Claude Dolbec, and for a fact knows him personnaly ''Mr. Underground of Montreal'' He alway stays lo-fi, behind the scene, but he was there way before you punks. I havent seen Claude in years , still , he is the god father of my son. If you meet him again , please give him my e mail and my phone number 514 299 9147.